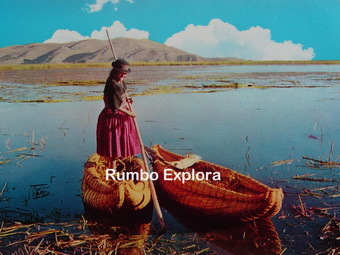 PUNO – UROS ISLAND – PUNO: A boat ride of 25 minutes to the island of Uros. Fishermen and hunters inhabit the floating islands of Uros. The residents of the Uros use the totora reed (aquatic plant) that grows in the lake, to create life conditions and ensure that the islands stay afloat. The dense roots that generate these plants support the island. The Uros use the totora reed to build their islands, houses, for cooking, eating, and to sale in the city of Puno, besides to barter (exchange) with products such as quinoa, potatoes, barley and wool. This culture appeared over 3000 years ago and the people have spoken as a language Uro puquina and they had dark-colored blood and they did not feel cold, the last person who still spoke the Uru Puquina language died in 1951, now a day the population speak Aimara Language. On Uros live more than 2000 people, divided into 80 artificial islands, where there is a garden, primary school, a medical center and an Adventist church, besides guest rooms for visitors and the reed boats the unique method of transportation which is also used for fishing. 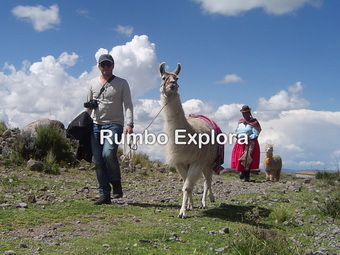 Then a return trip to Puno. 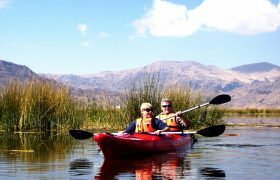 US$45.00 Inclusions: Transfer hotel / port / hotel, sea kayak, private guide, entrance fees. 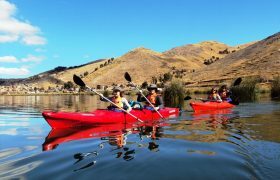 Group size: 10 – 15 persons US$60.00 Inclusions: Transfer hotel / port / hotel, sea kayak, private guide, entrance fees. 01 person Inclusions: Transport hotel/port/hotel, private regular boat, private guide, entrance fees. 01 person Inclusions: Transport hotel/port/hotel, private luxury speed boat, private guide, entrance fees. 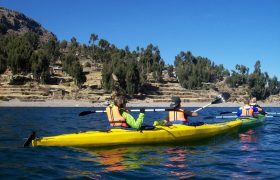 WHAT IS INCLUDED: The tour INCLUDE round trip transport from hotel/port/hotel, experienced guides in kayaking at Lake Titicaca, (in English & Spanish), basic safety paddling instructions before departures, rescue motor boat (allways nearby the participants), entrance fees to Uros Island US$3. Besides pre-trip information + organization and all local taxes. There are no hidden extras in our prices. Our regular boat has 25 comfortable seats, velocity 8 knots + night navigation lights + oxygen & first aid kit + life jackets + toilet + panoramic windows + reclining seats. 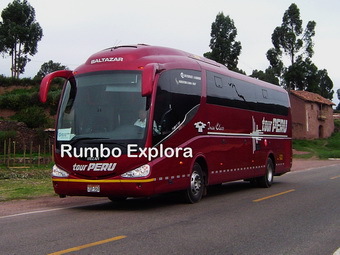 Rumbo Explora provide to visitors all possible choices. Beware with illegal local Tour Operators or middleman, who do not pay the real costs to suppliers (transport, local restaurants & guest houses, tour guides & drivers). Help us avoid the explotation. NOT INCLUDED: For group tours/shared service, round trip transfer from hotel / port / hotel from hotels with Lake view as Hotel Sonesta Posada, Casa Andina Private Collection, Eco Inn, Libertador and Jose Antonio. 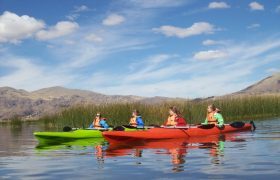 Share the post "Kayaking at Lake Titicaca – Daily departures"